Person Responsible: A. Moore et al. Professor Anna Moore, Australian National University, Australia, on behalf of the AAA steering committee. The AAA SRP continues to satisfy the goals of the 2014-2018 operational plan. During the 2016-18 period, AAA convened and supported both a half day science session and business meeting at the SCAR open science conference in Kuala Lumpur. Four members of the steering committee were rotated as previously presented to SCAR ExCom. The fourth AAA workshop was hosted by the National Astronomical Research Institute of Thailand (NARIT) in Chiang Mai, Thailand on July 31-Aug 4, 2017. Approximately fifty participants attended this meeting from all over the globe to present their work in Antarctic Astronomy at this international forum. There was significant participation from the astronomical community of Thailand and the South-East Asia region at this meeting. AAA will convene the community for a science session and business meeting at Polar2018 in Davos. The SCAR AAA website has been significantly updated during this period to produce a web portal for all astronomical researchers to access existing data and most recent publications. 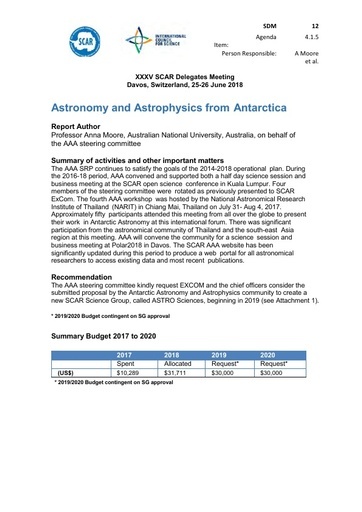 The AAA steering committee kindly request EXCOM and the chief officers consider the submitted proposal by the Antarctic Astronomy and Astrophysics community to create a new SCAR Science Group, called ASTRO Sciences, beginning in 2019.